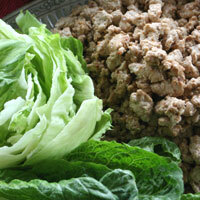 Lettuce wraps make a light and very flavorful meal. Serve them with Asian Salad! 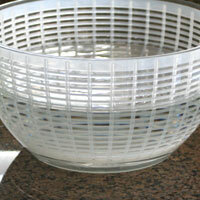 Fill a salad spinner or large bowl with cold water. Set aside. With a knife cut the core out of the lettuce. Remove the outer leaves if they are beginning to wilt. Gently peel off leaves leaving them as intact as possible. Very large leaves can be cut in half. Save the scraps for a salad. Place the large leaves in the water and swish gently to rinse. 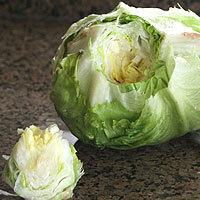 Running lettuce under the tap can bruise it and take away some of the crispness. If using a salad spinner, dump the excess water and spin dry. If using a bowl set leaves on paper towels to dry. In a small bowl mix all of the sauce ingredients except the olive oil. In a slow steady stream add the olive oil whisking constantly to emulsify. 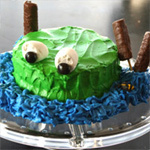 A hand blender or food processor work great for this. Set aside. 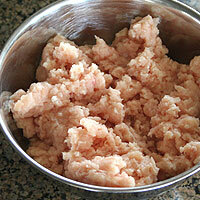 Working in batches pulse a food processor or blender to chop the meat to a ground beef texture. Only process 6 or so pieces at a time so they will chop evenly. Transfer to a medium bowl and set aside. Continue processing until you've ground all the chicken. Heat oil in a large skillet over medium/high heat until shimmering but not smoking. Add garlic and cook briefly 10 -20 seconds. Add chicken and brown evenly. As always with meat don’t stir or touch too much or it will toughen and lose moisture. Do stir it however or it won't cook evenly. 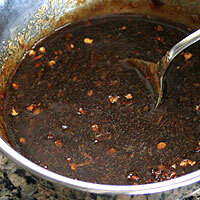 Once the chicken is cooked through reduce heat to low and stir in sauce. Cook 2-3 minutes. 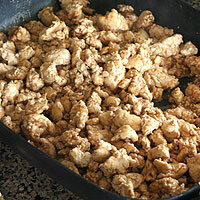 Transfer chicken to a serving bowl or platter. Spoon chicken into lettuce leaves. Enjoy! These are pretty fool proof, but things can always go wrong. 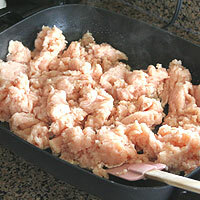 Don't over-process the meat or you'll end up with mush. Don't let the hot meat and lettuce sit together for long or the lettuce will wilt. 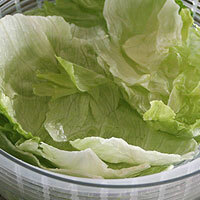 Fill a salad spinner or large bowl with cold water. Set aside. With a knife cut the core out of the lettuce. Remove the outer leaves if they are beginning to wilt. Gently peel off leaves leaving them as intact as possible. Very large leaves can be cut in half. Save the scraps for a salad. Place the large leaves in the water and swish gently to rinse. Running lettuce under the tap can bruise it and take away some of the crispness. If using a salad spinner, dump the excess water and spin dry. If using a bowl set leaves on paper towels to dry. In a blender or food processor add . Process until smooth. With the machine running add oil in a slow steady stream. Process until thickened. Stir in pepper. In a small bowl mix all the sauce ingredients except the olive oil. In a slow steady stream add the olive oil whisking constantly to emulsify. 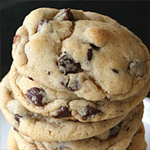 A hand blender or food processor work great for this. Set aside. 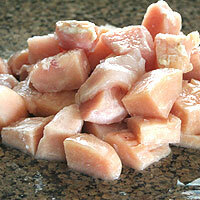 Cut the chicken into large chunks. 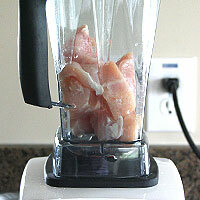 Working in batches pulse a food processor or blender to process the meat to ground beef texture. Only process 6 or so pieces at a time so they will chop evenly. Transfer to a medium bowl and set aside. Continue processing until you've ground all the chicken. 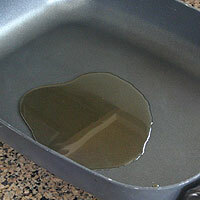 Heat oil in a large skillet over medium/high heat until shimmering but not smoking. Add garlic and cook briefly 10 -20 seconds. Add chicken and brown evenly. As always with meat don’t stir or touch too much or it will toughen and lose moisture. Do stir it however or it won't cook evenly. I like to serve romaine lettuce along with the iceberg. 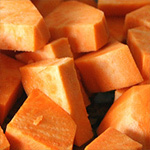 It isn't as crisp or sweet, but the leaves are easier to deal, healthier, and still tastes great! 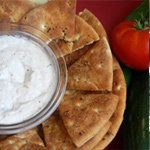 This meal keeps well and can be made ahead of time. Refrigerate the cooked meat and heat right before serving. Clean and store and lettuce wrapped in a paper towel and stored in a zipper lock bag.